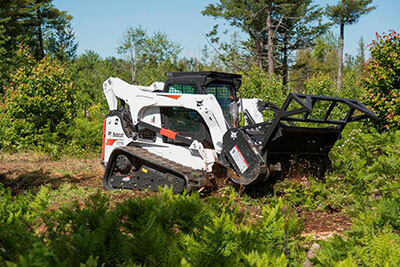 Bobcat released its 70-inch forestry cutter attachment, which it said features up to 17 percent more mulching production. The attachment is approved for use with M2-Series compact track loaders—T750, T770 and T870—and the S850 skid-steer loader. An additional 400-pound counterweight is required when using the 70-inch model with T750 and T770 compact track loaders. Approved skid-steer and compact track loaders require high-flow auxiliary hydraulics to operate the attachment. When the attachment is tilted forward, the material is thrown against the counter combs that reduce the wood to fine mulch and provide wear protection for the rear of the housing. An optional front gate can be lowered if the operator needs finer mulch. While high-flow auxiliary hydraulics are required to operate the new 70-inch forestry cutter, the tube-style drum and spiral tooth pattern allow one tooth to engage at a time for smoother operation while using less horsepower. In addition, the forestry cutter comes standard with 2-Speed travel for increased drum torque and improved productivity. The double-tipped carbide teeth rip through trees and underbrush, providing long life and uptime protection for the attachment, Bobcat says. A low number of forestry cutter drum teeth allow operators to reduce teeth replacement costs and ensure faster knockdown of trees. A forestry applications kit must be installed on the loader to operate the forestry cutter attachment. The forestry door with 3/4-inch laminated polycarbonate is necessary to operate the attachment, helping to protect operators from flying debris and other objects. The forestry applications kit includes front and rear light guards, hydraulic quick coupler guard, fire extinguisher, level II FOPS, muffler guard, lift cylinder debris shields and polycarbonate top, rear and side windows (1/4-inch or 1/2-inch polycarbonate).